For other uses, see Angola (disambiguation). Angola (/ænˈɡoʊlə/ ( listen); Portuguese: [ɐ̃ˈɡɔlɐ]), officially the Republic of Angola (Portuguese: República de Angola; Kikongo, Kimbundu and Umbundu: Repubilika ya Ngola), is a west-coast country of south-central Africa. It is the seventh-largest country in Africa, bordered by Namibia to the south, the Democratic Republic of the Congo to the north, Zambia to the east, and the Atlantic Ocean to the west. 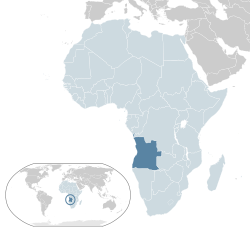 Angola has an exclave province, the province of Cabinda that borders the Republic of the Congo and the Democratic Republic of the Congo. The capital and largest city of Angola is Luanda. Angola has vast mineral and petroleum reserves, and its economy is among the fastest-growing in the world, especially since the end of the civil war; however, the standard of living remains low for most of the population, and life expectancy in Angola is among the lowest in the world, while infant mortality is among the highest. Angola's economic growth is highly uneven, with most of the nation's wealth concentrated in a disproportionately small sector of the population. Modern Angola was populated predominantly by nomadic Khoi and San prior to the first Bantu migrations. The Khoi and San peoples were neither pastoralists nor cultivators, but hunter-gatherers. They were displaced by Bantu peoples arriving from the north, most of whom likely originated in what is today northwestern Nigeria and southern Niger. Bantu speakers introduced the cultivation of bananas and taro, as well as large cattle herds, to Angola's central highlands and the Luanda plain. 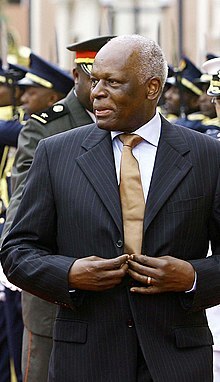 Hendese Bantu established a number of political entities; the best-known of these was the Kingdom of the Kongo, based in Angola, which extended northward to what is now the Democratic Republic of the Congo, the Republic of the Congo and Gabon. It established trade routes with other city-states and civilisations up and down the coast of southwestern and western Africa and even with Great Zimbabwe and the Mutapa Empire, although it engaged in little or no transoceanic trade. To its south lay the Kingdom of Ndongo, from which the area of the later Portuguese colony was sometimes known as Dongo. An MPLA staff car burns after being destroyed in the fighting outside Novo Redondo (present-day Sumbe) in late 1975. The MPLA abandoned its former Marxist ideology at its third party congress in 1990, and declared social democracy to be its new platform. Angola subsequently became a member of the International Monetary Fund; restrictions on the market economy were also reduced in an attempt to draw foreign investment. By May 1991 it reached a peace agreement with UNITA, the Bicesse Accords, which scheduled new general elections for September 1992. When the MPLA secured a major electoral victory, UNITA objected to the results of both the presidential and legislative vote count and returned to war. 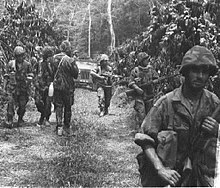 Following the election, the Halloween massacre occurred from 30 October to 1 November, where MPLA forces killed thousands of UNITA supporters. Angola has a serious humanitarian crisis; the result of the prolonged war, of the abundance of minefields, of the continued political (and to a much lesser degree) military activities in favour of the independence of the exclave of Cabinda (carried out in the context of the protracted Cabinda conflict by the FLEC), but most of all, by the depredation of the country's rich mineral resources by the régime. While most of the internally displaced have now settled around the capital, in the so-called musseques, the general situation for Angolans remains desperate. Drought in 2016 caused the worst food crisis in Southern Africa in 25 years. Drought affected 1.4 million people across seven of Angola's 18 provinces. Food prices rose and acute malnutrition rates doubled, with more than 95,000 children affected. Food insecurity was expected[by whom?] to worsen from July to December 2016. At 1,246,620 km2 (481,321 sq mi), Angola is the world's twenty-third largest country - comparable in size to Mali, or twice the size of France or of Texas. It lies mostly between latitudes 4° and 18°S, and longitudes 12° and 24°E. Angola borders Namibia to the south, Zambia to the east, the Democratic Republic of the Congo to the north-east and the South Atlantic Ocean to the west. 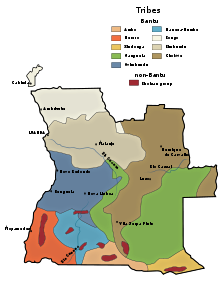 The coastal exclave of Cabinda in the north has borders with the Republic of the Congo to the north and with the Democratic Republic of the Congo to the south. Angola's capital, Luanda, lies on the Atlantic coast in the northwest of the country. Köppen-Geiger climate classification map for Angola. After 38 years of rule, in 2017 President dos Santos stepped down from MPLA leadership. The leader of the winning party at the parliamentary elections in August 2017 would become the next president of Angola. The MPLA selected Defense Minister General João Lourenço and won the election. In what has been described as a political purge[by whom?] to cement his power and reduce the influence of the Dos Santos family, Lourenço subsequently sacked the chief of the national police, Ambrósio de Lemos, and the head of the intelligence service, Apolinário José Pereira. Both are considered allies of former president Dos Santos. He also removed Isabel Dos Santos, daughter of the former president, as head of the country's state oil company Sonangol. The Angolan Armed Forces (AAF) are headed by a Chief of Staff who reports to the Minister of Defence. There are three divisions—the Army (Exército), Navy (Marinha de Guerra, MGA) and National Air Force (Força Aérea Nacional, FAN). Total manpower is 107,000; plus paramilitary forces of 10,000 (2015 est.). Its equipment includes Russian-manufactured fighters, bombers and transport planes. There are also Brazilian-made EMB-312 Tucanos for training, Czech-made L-39s for training and bombing, and a variety of western-made aircraft such as the C-212\Aviocar, Sud Aviation Alouette III, etc. A small number of AAF personnel are stationed in the Democratic Republic of the Congo (Kinshasa) and the Republic of the Congo (Brazzaville). The National Police departments are Public Order, Criminal Investigation, Traffic and Transport, Investigation and Inspection of Economic Activities, Taxation and Frontier Supervision, Riot Police and the Rapid Intervention Police. The National Police are in the process of standing up an air wing,[when?] to provide helicopter support for operations. The National Police are developing their criminal investigation and forensic capabilities. The force has an estimated 6,000 patrol officers, 2,500 taxation and frontier supervision officers, 182 criminal investigators and 100 financial crimes detectives and around 90 economic activity inspectors. A Supreme Court serves as a court of appeal. The Constitutional Court is the supreme body of the constitutional jurisdiction, established with the approval of Law no. 2/08, of 17 June – Organic Law of the Constitutional Court and Law n. 3/08, of 17 June – Organic Law of the Constitutional Process. The legal system is based on Portuguese and customary laws, but it is weak and fragmented. There are only 12 courts in more than 140 counties in the country. Its first task was the validation of the candidacies of the political parties to the legislative elections of 5 September 2008. Thus, on 25 June 2008, the Constitutional Court was institutionalized and its Judicial Counselors assumed the position before the President of the Republic. Currently, seven advisory judges are present, four men and three women. 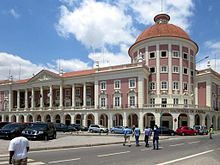 Angola is a founding member state of the Community of Portuguese Language Countries (CPLP), also known as the Lusophone Commonwealth, and international organization and political association of Lusophone nations across four continents, where Portuguese is an official language. On 16 October 2014, Angola was elected for the second time a non-permanent member of the United Nations Security Council, with 190 favorable votes out of a total of 193. The term of office began on 1 January 2015 and expired on 31 December 2016. In 2019, homosexual acts were decriminalized in Angola, and the government also prohibited discrimination based on sexual orientation. The vote was overwhelming: 155 for, 1 against, 7 abstaining. Angola has diamonds, oil, gold, copper and a rich wildlife (dramatically impoverished during the civil war), forest and fossil fuels. Since independence, oil and diamonds have been the most important economic resource. Smallholder and plantation agriculture dramatically dropped in the Angolan Civil War, but began to recover after 2002. The transformation industry[clarification needed] of the late colonial period collapsed at independence, because of the exodus of most of the ethnic Portuguese population, but it has begun to re-emerge with updated technologies, partly because of an influx of new Portuguese entrepreneurs. Similar developments have taken place in the service sector. 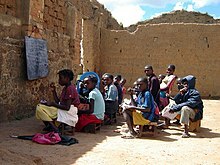 A study carried out in 2008 by the Angolan Instituto Nacional de Estatística found that in rural areas roughly 58% must be classified as "poor" according to UN norms, but in the urban areas only 19%, and an overall rate of 37%. In cities, a majority of families, well beyond those officially classified as poor, must adopt a variety of survival strategies. [clarification needed] In urban areas social inequality is most evident and it's extreme in Luanda. In the Human Development Index Angola constantly ranks in the bottom group. According to the Heritage Foundation, a conservative American think tank, oil production from Angola has increased so significantly that Angola now is China's biggest supplier of oil. "China has extended three multibillion dollar lines of credit to the Angolan government; two loans of $2 billion from China Exim Bank, one in 2004, the second in 2007, as well as one loan in 2005 of $2.9 billion from China International Fund Ltd."
Growing oil revenues also created opportunities for corruption: according to a recent Human Rights Watch report, 32 billion US dollars disappeared from government accounts in 2007–2010. Furthermore, Sonangol, the state-run oil company, controls 51% of Cabinda's oil. Due to this market control the company ends up determining the profit received by the government and the taxes it pays. The council of foreign affairs states that the World Bank mentioned that Sonangol " is a taxpayer, it carries out quasi-fiscal activities, it invests public funds, and, as concessionaire, it is a sector regulator. This multifarious work programme creates conflicts of interest and characterises a complex relationship between Sonangol and the government that weakens the formal budgetary process and creates uncertainty as regards the actual fiscal stance of the state." With a stock of assets corresponding to 70 billion Kz (US$6.8 billion), Angola is now the third largest financial market in sub-Saharan Africa, surpassed only by Nigeria and South Africa. According to the Angolan Minister of Economy, Abraão Gourgel, the financial market of the country grew modestly from 2002 and now lies in third place at the level of sub-Saharan Africa. Agriculture and forestry is an area of potential opportunity for the country. The African Economic Outlook organization states that "Angola requires 4.5 million tonnes a year of grain but grows only about 55% of the corn it needs, 20% of the rice and just 5% of its required wheat". In addition, the World Bank estimates that "less than 3 percent of Angola's abundant fertile land is cultivated and the economic potential of the forestry sector remains largely unexploited" . On 11 March 2015, the First Angolan Forum of Telecommunications and Information Technology was held in Luanda under the motto "The challenges of telecommunications in the current context of Angola", to promote debate on topical issues on telecommunications in Angola and worldwide. A study of this sector, presented at the forum, said Angola had the first telecommunications operator in Africa to test LTE – with speeds up to 400 Mbit/s – and mobile penetration of about 75%; there are about 3.5 million smartphone in the Angolan market; There are about 25,000 kilometres (16,000 miles) of optical fibre installed in the country. The first Angolan satellite, AngoSat-1, was launched into orbit on 26 December 2017. It was launched from the Baikonur space center in Kazakhstan on board a Zenit 3F rocket. The satellite was built by Russia's RSC Energia, a subsidiary of the state-run space industry player Roscosmos. The satellite payload was supplied by Airbus Defence & Space. Due to an on-board power failure during solar panel deployment, on 27 December, RSC Energia revealed that they lost communications contact with the satellite. Although, subsequent attempts to restore communications with the satellite were successful, the satellite eventually stopped sending data and RSC Energia confirmed that AngoSat-1 was inoperable. The launch of AngoSat-1 was aimed at ensuring telecommunications throughout the country. According to Aristides Safeca, Secretary of State for Telecommunications, the satellite was aimed at providing telecommunications services, TV, internet and e-government and was expected to remain in orbit "at best" for 18 years. A replacement satellite named AngoSat-2 is in the works and is expected to be in service by 2020. The management of the top-level domain '.ao' passed from Portugal to Angola in 2015, following new legislation. A joint decree of minister of Telecommunications and Information Technologies José Carvalho da Rocha and the minister of Science and Technology, Maria Cândida Pereira Teixeira, states that "under the massification" of that Angolan domain, "conditions are created for the transfer of the domain root '.ao' of Portugal to Angola". It is estimated that Angola was host to 12,100 refugees and 2,900 asylum seekers by the end of 2007. 11,400 of those refugees were originally from the Democratic Republic of Congo, who arrived in the 1970s. As of 2008[update] there were an estimated 400,000 Democratic Republic of the Congo migrant workers, at least 220,000 Portuguese, and about 259,000 Chinese living in Angola. 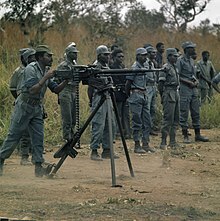 As of 2008[update] the U.S. Department of State estimates the Muslim population at 80,000–90,000, less than 1% of the population, while the Islamic Community of Angola puts the figure closer to 500,000. Muslims consist largely of migrants from West Africa and the Middle East (especially Lebanon), although some are local converts. The Angolan government does not legally recognize any Muslim organizations and often shuts down mosques or prevents their construction. In September 2014, the Angolan Ministry of Education announced an investment of 16 million Euros in the computerisation of over 300 classrooms across the country. The project also includes training teachers at a national level, "as a way to introduce and use new information technologies in primary schools, thus reflecting an improvement in the quality of teaching". In 1972, one of Angola's first feature films, Sarah Maldoror's internationally co-produced Sambizanga, was released at the Carthage Film Festival to critical acclaim, winning the Tanit d'Or, the festival's highest prize. ^ a b c d "Report for Selected Countries and Subjects: Angola". International Monetary Fund. ^ "Gini Index". World Bank. Archived from the original on 9 February 2015. ^ "Life expectancy at birth". World Fact Book. United States Central Intelligence Agency. 2014. Archived from the original on 20 January 2016. Retrieved 4 March 2010. ^ "Transparency and Accountability in Angola". Human Rights Watch. Archived from the original on 6 October 2015. Retrieved 1 April 2016. ^ Leander (18 May 2016). "Kingdom of Kongo 1390 – 1914". South African History Online. Archived from the original on 23 February 2019. Retrieved 25 February 2019. ^ "The Story of Africa". BBC. Archived from the original on 24 May 2010. Retrieved 27 June 2010. ^ Fleisch, Axel (2004). "Angola: Slave Trade, Abolition of". In Shillington, Kevin (ed.). Encyclopedia of African History 3-Volume Set. 1. Routledge. pp. 131–133. ISBN 1-57958-245-1. ^ Global Investment and Business Center (1 January 2006). Angola in the Eighteenth Century: Slave trading in the 1700s. Angola President Jose Eduardo Dos Santos Handbook. Int'l Business Publications. p. 153. ISBN 0739716069. ^ World Bank. The History of Brazil–Africa Relations (PDF). Bridging the Atlantic. p. 27. Archived (PDF) from the original on 30 May 2016. Retrieved 14 May 2016. ^ a b c d e f Collelo, Thomas, ed. (1991). Angola, a Country Study. Area Handbook Series (Third ed.). Washington, D.C.: Department of the Army, American University. pp. 14–26. ISBN 978-0160308444. ^ a b c d e Cornwell, Richard (1 November 2000). "The War of Independence" (PDF). Pretoria: Institute for Security Studies. Archived from the original (PDF) on 21 February 2015. Retrieved 20 February 2015. ^ a b c d Ferreira, Manuel (2002). Brauer, Jurgen; Dunne, J. Paul (eds.). Arming the South: The Economics of Military Expenditure, Arms Production and Arms Trade in Developing Countries. Basingstoke: Palgrave-Macmillan. pp. 251–255. ISBN 978-0-230-50125-6. ^ "How southern Africa is coping with worst global food crisis for 25 years". The Guardian. Archived from the original on 25 December 2016. Retrieved 31 December 2016. Drought is affecting 1.4 million people across seven of Angola’s 18 provinces. Food prices have rocketed and acute malnutrition rates have doubled, with more than 95,000 children affected. Food insecurity is expected to worsen from July to the end of the year. ^ "CIA – The World Factbook – Country Comparison :: Area". United States Central Intelligence Agency. Archived from the original on 9 February 2014. Retrieved 13 July 2014. ^ "Cabinda". Global Security. Archived from the original on 8 July 2014. ^ Beck, Hylke E.; Berg, Alexis; Vergopolan, Noemi; McVicar, Tim R.; Zimmermann, Niklaus E.; Wood, Eric F. (30 October 2018). "Present and future Köppen-Geiger climate classification maps at 1-km resolution". Scientific Data. 5: 180214. doi:10.1038/sdata.2018.214. ISSN 2052-4463. Archived from the original on 1 April 2019. Retrieved 26 December 2018. ^ Jury, M. R.; Matari, E .E. ; Matitu, M. (2008). "Equatorial African climate teleconnections". Theoretical and Applied Climatology. 95 (3–4): 407–416. Bibcode:2009ThApC..95..407J. doi:10.1007/s00704-008-0018-4. ^ "Angola". State.gov. US Department of State. Archived from the original on 23 November 2016. Retrieved 22 November 2016. ^ a b c d "CIA – The World Factbook". United States Central Intelligence Agency. Archived from the original on 16 August 2011. Retrieved 15 May 2007. ^ a b c "Angola". Freedom in the World 2014. Freedom House. Archived from the original on 7 February 2015. Retrieved 7 February 2015. ^ "Ibrahim Index of African Governance". Mo Ibrahim Foundation. Archived from the original on 1 August 2014. Retrieved 9 August 2014. ^ Angolan Leader Dos Santos to Step Down After 38 Years in Power Archived 7 April 2017 at the Wayback Machine. Bloomberg (3 February 2017). Retrieved on 26 April 2017. ^ En Angola, le ministre de la Défense devrait succèder au président Dos Santos Archived 25 March 2017 at the Wayback Machine. Lefigaro.fr. Retrieved on 26 April 2017. ^ "Angola's Lourenco replaces police and intelligence chiefs". Reuters. 20 November 2017. Archived from the original on 20 November 2017. Retrieved 21 November 2017. ^ "Angola sacks Africa's richest woman". BBC News. British Broadcasting Corporation. 15 November 2017. Archived from the original on 18 November 2017. Retrieved 21 November 2017. ^ "Angola decriminalises homosexuality and bans discrimination based on sexual orientation". The Evening Standard. 24 January 2019. Archived from the original on 24 January 2019. Retrieved 25 January 2019. ^ "Resultados Resultados Definitivos do Recenseamento Geral da População e da Habitação de Angola 2014" (PDF). Instituto Nacional de Estatística. March 2016. p. 27. Archived from the original (PDF) on 6 May 2016. ^ "Angola profile". BBC News. 22 December 2013. Archived from the original on 24 June 2018. Retrieved 21 June 2018. ^ Angola Financial Sector Profile: MFW4A – Making Finance Work for Africa Archived 13 May 2011 at the Wayback Machine. MFW4A. Retrieved 9 August 2013. ^ "The Increasing Importance of African Oil". Power and Interest Report. 20 March 2006. Archived from the original on 5 May 2006. ^ "Angolo". Global Trade Logistic. Archived from the original on 21 January 2019. Retrieved 20 January 2019. ^ "Luanda, capital of Angola, retains title of world's most expensive for expats. The Daily Telegraph. Retrieved 9 August 2013". Archived from the original on 5 September 2017. Retrieved 4 April 2018. ^ "Marching towards riches and democracy?" Archived 31 October 2014 at the Wayback Machine The Economist. 30 August 2008. p. 46. ^ "Angola: Country Admitted As Opec Member". Angola Press Agency. 14 December 2006. Archived from the original on 19 October 2012. Retrieved 15 December 2006. ^ "Angolan Diamond Centenary Conference 2013 Highlights Endiama and Alrosa Joint Venture for Future Geological Exploration of diamond deposits of Angola's Territory" (PDF). Press release. angolancentenary.com. Archived from the original (PDF) on 14 November 2013. ^ Dolan, Kerry A. (23 January 2013). "Isabel Dos Santos, Daughter Of Angola's President, Is Africa's First Woman Billionaire" Archived 15 August 2017 at the Wayback Machine. Forbes. ^ Alt, Robert. "Into Africa: China's Grab for Influence and Oil". Heritage.org. Archived from the original on 13 March 2010. Retrieved 27 June 2010. ^ "Angola's Political and Economic Development". Council on Foreign Relations. Archived from the original on 21 April 2016. ^ "Angola: Explain Missing Government Funds". Human Rights Watch. 20 December 2011. Archived from the original on 21 December 2011. Retrieved 22 December 2011. ^ Redvers, Louise POVERTY-ANGOLA: Inter Press Service News Agency – NGOs Sceptical of Govt's Rural Development Plans Archived 12 May 2010 at the Wayback Machine. ^ Manuel Alves da Rocha (2010) Desigualdades e assimetrias regionais em Angola: Os factores da competitividade territorial Archived 18 March 2015 at the Wayback Machine, Luanda: Centro de Estudos e Investigação Científica da Universidade Católica de Angola. ^ "Sectores Económicos Prioritários" (in Portuguese). ANIP. Archived from the original on 11 April 2013. ^ "Angola Cables e parceiros estrangeiros anunciam construção de cabo submarino" (in Portuguese). ANGOP. 14 October 2014. Archived from the original on 25 November 2014. Retrieved 13 November 2014. ^ Machado, André (30 January 2014). "Cabo submarino que ligará Brasil à África terá capacidade de 40 terabits por segundo" (in Portuguese). O Globo. Archived from the original on 12 October 2014. Retrieved 13 November 2014. ^ Inácio, Adelina (12 March 2015). "Nação está mais ligada" (in Portuguese). Jornal de Angola. Archived from the original on 19 March 2015. Retrieved 12 March 2015. ^ "Angola has about 14 million mobile phone network users – Minister". ANGOP. 12 March 2015. Archived from the original on 18 March 2015. Retrieved 12 March 2015. ^ "Angola com crescimento anual superior a 55% no sector das TIC" (in Portuguese). Platina Line. 12 March 2015. Archived from the original on 13 July 2015. Retrieved 16 April 2015. ^ "Sector das TIC com crescimento anual superior a 55 por cento na última década" (in Portuguese). Ver Angola. 13 March 2015. Archived from the original on 16 April 2015. Retrieved 16 April 2015. ^ "Satbeams - World Of Satellites at your fingertips". Satbeams Web and Mobile. Archived from the original on 17 September 2018. Retrieved 17 September 2018. ^ "AngoSat 1". space.skyrocket.de. Archived from the original on 17 September 2018. Retrieved 17 September 2018. ^ "Conclusion works of "Angosat" project set for 2016". ANGOP. 8 September 2014. Archived from the original on 15 December 2014. Retrieved 11 December 2014. ^ Agência Lusa (4 November 2014). "Primeiro satélite angolano pronto para ser lançado em 2016" (in Portuguese). Observador. Archived from the original on 29 November 2014. Retrieved 11 December 2014. ^ "GGPEN - Leia Mais". www.ggpen.gov.ao. Archived from the original on 17 September 2018. Retrieved 17 September 2018. ^ "Angola Archived 16 July 2017 at the Wayback Machine". CIA World Factbook. ^ World Refugee Survey 2008 – Angola Archived 10 May 2011 at the Wayback Machine, UNHCR. NB: This figure is highly doubtful, as it makes no clear distinction between migrant workers, refugees and immigrants. ^ "Angola: Cerca de 259.000 chineses vivem atualmente no país". Visão. 25 April 2012. Archived from the original on 9 May 2013. Retrieved 13 January 2013. ^ Bender, Gerald; Yoder, Stanley (1974). "Whites in Angola on the Eve of Independence. The Politics of Numbers". Africa Today. 21 (4): 23–27. JSTOR 4185453. ^ Flight from Angola Archived 25 May 2013 at WebCite, The Economist , 16 August 1975 puts the number at 500,000, but this is an estimate lacking appropriate sources. ^ Siza, Rita (6 June 2013). "José Eduardo dos Santos diz que trabalhadores portugueses são bem-vindos em Angola". Público. Lisbon. Archived from the original on 12 June 2013. Retrieved 17 June 2013. ^ "Angola, Brazil: A culture shock divide · Global Voices". 17 August 2008. Archived from the original on 16 March 2017. Retrieved 14 August 2017. ^ "Angola: português é falado por 71,15% de angolanos" (PDF). Archived from the original (PDF) on 26 December 2016. ^ "Angola". State.gov. 19 September 2008. Archived from the original on 13 July 2014. Retrieved 13 July 2014. ^ "ANGOLA 2012 INTERNATIONAL RELIGIOUS FREEDOM REPORT" (PDF). state.gov. Archived (PDF) from the original on 4 May 2017. Retrieved 24 June 2017. ^ Angola: Religious Freedom Profile at the Association of Religion Data Archives Archived 11 April 2010 at the Wayback Machine Brian J Grim and Roger Finke. "International Religion Indexes: Government Regulation, Government Favoritism and Social Regulation of Religion". Interdisciplinary Journal of Research on Religion. 2 (2006) Article 1: www.religjournal.com. ^ "International Religious Freedom Report – Angola". U.S. Department of State. 1 January 2004. Archived from the original on 28 May 2010. Retrieved 27 June 2010. ^ Culture and customs of Angola. Westport, Connecticut: Greenwood Press. 2007. p. 40. ISBN 978-0-313-33147-3. ^ "International Grants 2005" (PDF). Archived from the original (PDF) on 13 November 2008. ^ Seal, AJ; Creeke; Dibari; Cheung; Kyroussis; Semedo; Van Den Briel (January 2007). "Low and deficient niacin status and pellagra are endemic in postwar Angola". Am. J. Clin. Nutr. 85 (1): 218–24. hdl:10144/125625. PMID 17209199. ^ "WHO: Yellow fever outbreak is 'serious and of great concern'". Archived from the original on 29 May 2016. Retrieved 29 May 2016. ^ "National adult literacy rates (15+), youth literacy rates (15–24) and elderly literacy rates (65+)". UNESCO Institute for Statistics. Archived from the original on 29 October 2013. Retrieved 27 July 2013. ^ "Angola – Statistics". UNICEF. Archived from the original on 13 June 2010. Retrieved 27 June 2010. ^ Dovey, Lindiwe (11 March 2015). Curating Africa in the Age of Film Festivals. New York, NY: Palgrave MacMillan. ISBN 1137404140. Archived from the original on 15 September 2018. Retrieved 15 September 2018. ^ Poncianinho, Mestre; Almeida, Ponciano (2007). Capoeira: The Essential Guide to Mastering the Art. New Holland Publishers. pp. 18–. ISBN 978-1-84537-761-8. Archived from the original on 20 March 2015. Retrieved 14 October 2015. "Angola". The World Factbook. Central Intelligence Agency.